If the thrust clearance is more than the maximum, replace the connecting rod. If necessary, replace the crankshaft. 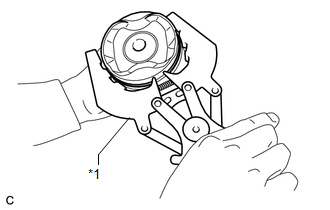 (a) Check the alignment marks on the connecting rod and cap to ensure correct reassembly. 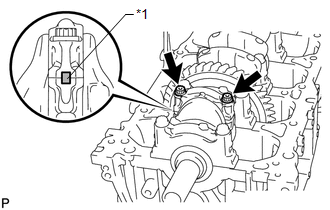 (b) Remove the 2 bolts and connecting rod cap. Keep the lower bearing and connecting rod cap together. (c) Clean the crank pin and bearing. (d) Check the crank pin and bearing for pitting and scratches. (e) Lay a strip of Plastigage on the crank pin. (f) Check that the front mark of the connecting rod cap is facing in the correct direction. 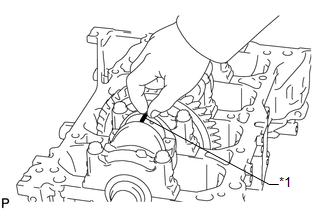 (g) Apply a light coat of engine oil to the threads and under the heads of the connecting rod bolts. 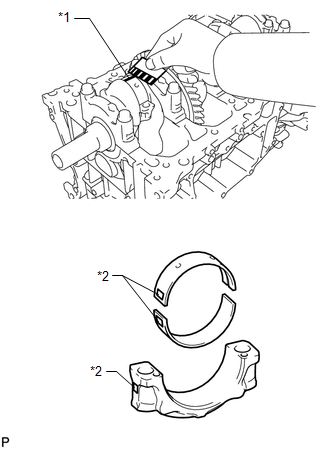 (h) Install and alternately tighten the bolts of the connecting rod cap in several steps. 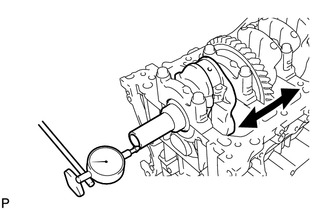 Do not turn the crankshaft during the measurement. If any one of the connecting rod bolts does not meet the torque specification, replace the connecting rod bolts. (i) Mark the front of each connecting rod bolt with paint. 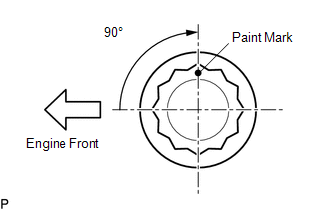 (j) Tighten the bolts 90° as shown in the illustration. (k) Remove the 2 bolts and connecting rod cap. (l) Measure the Plastigage at its widest point. If the oil clearance is more than the maximum, replace the connecting rod bearing. If necessary, grind or replace the crankshaft. If replacing a bearing, select a new one with the same number as marked on the connecting rod. There are 3 sizes of standard bearings, marked "1", "2" and "3" accordingly. 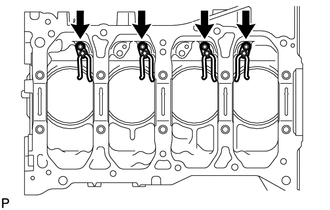 (m) Perform the inspection above for each cylinder. (b) Remove the 8 bolts, 4 connecting rod caps and 4 lower bearings. 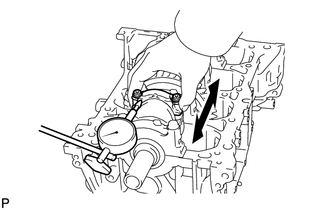 (c) Push the piston, connecting rod assembly and upper bearing through the top of the cylinder block. 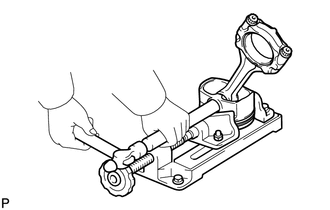 Be sure to arrange the removed piston and connecting rod assemblies in such a way that they can be reinstalled exactly as before. (a) Remove the connecting rod bearings from the connecting rods and connecting rod caps. 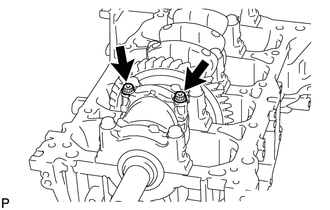 (a) Using several steps, uniformly loosen and remove the 10 bearing cap bolts in the sequence shown in the illustration. (b) Remove the 5 bearing caps from the cylinder block. Keep the No. 2 crankshaft bearings and crankshaft bearing caps together. Arrange the bearing caps in the correct order. 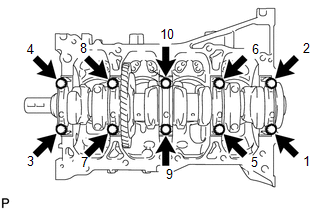 (c) Remove the crankshaft from the cylinder block. 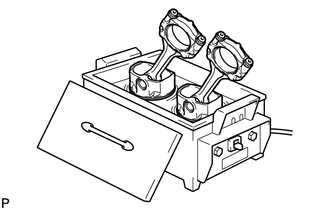 Keep the crankshaft bearings and crankshaft thrust washers together with the cylinder block. (d) Check each crankshaft journal and bearing for pitting and scratches. If the journal or bearing is damaged, replace the bearings. If necessary, replace the crankshaft. 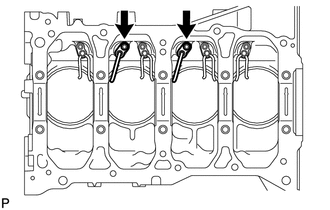 (a) Remove the thrust washers from the cylinder block. 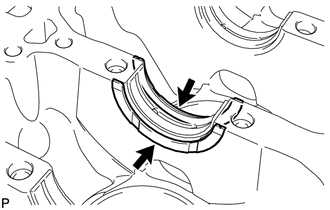 (a) Remove the crankshaft bearings from the cylinder block and bearing caps. Arrange the bearings in the correct order. 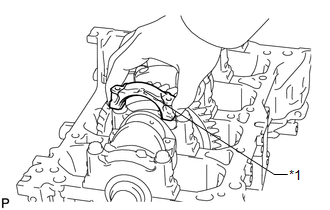 (a) Using a screwdriver, remove the 2 pulley keys from the crankshaft. (b) Remove the oil ring and expander by hand. (a) Insert a small screwdriver into the service hole, pry out the snap ring on the front side. Do not remove the snap ring on the rear side unless it is necessary. When the snap ring needs to be removed, be careful not to damage the piston. 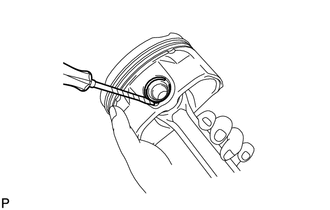 (a) Gradually heat the piston up to 80 to 90°C (176 to 194°F). (b) Using a plastic-faced hammer and brass bar, lightly tap out the piston pin. Then remove the connecting rod. Be sure to arrange the removed pistons, pins, rings, connecting rods and bearings in such a way that the parts can be reinstalled exactly as before. (a) Using a 5 mm hexagon wrench, remove the 2 bolts and 2 oil nozzles. 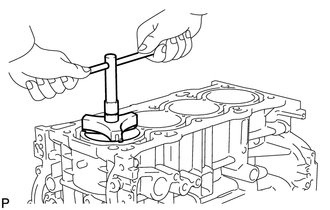 (a) Using a 5 mm hexagon wrench, remove the 4 bolts and 4 oil nozzles.